Don’t work out in the cold, instead use our diesel radiant heater to keep warm and comfortable while you work outside on trucks or equipment. This heater produces 125,000 BTU’s of deep penetrating heat without harsh fumes. Our radiant heater works well even in windy conditions because instead of forced hot air it’s radiant convection heat technology allows heat to be transmitted directly to an object or person. The radiant heater can hold up to 16 gallons of fuel (diesel or kerosene) and can provide up to 16 hours of heat. For safety, the heater has a flame-out sensor and error indicator light. Need portability? No problem, the heater can easily run off a 12 volt cigarette lighter power inverter. Does your shop operation produce waste oil, but you don’t want to spend $10,000 or more on a traditional waste oil heater? We have a solution! 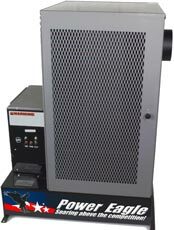 The Power Eagle Eliminator waste oil heater is small, simple, reliable and affordable! 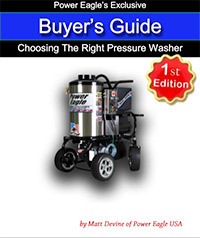 Turn your waste oil into free heat for your shop or garage! The Power Eagle Eliminator heater produces 120,000 BTU’s of heat using it’s ultra-simplistic design. Unlike traditional waste oil heaters which are expensive and complicated, this unit features a simple plunger style fuel pump which drops small amounts of oil onto the vaporizer pan. Combustion is achieved in a clean, simple manner without complex filters and compressed air for fuel atomization. 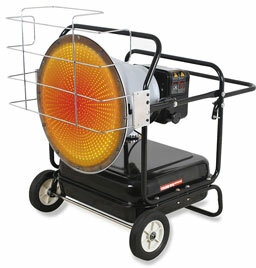 The Eliminator heater hold 15 gallons of waste oil and will burn .8 gallons per hour. Factory wired thermostat makes for easy installation. Simply plug into 115V outlet and install 6” vent piping. Best of all, the Eliminator only takes up 23” x 30” of floor space!